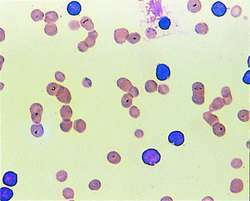 a hematologic, malignant disease characterized by large numbers of lymphoblasts in the bone marrow, circulating blood, lymph nodes, spleen, liver, and other organs. The number of normal blood cells is usually reduced. More than three-fourths of cases in the United States occur in children, with the greatest number diagnosed between 2 and 5 years of age. The risk of the disease is increased for people with Down syndrome and for siblings of leukemia patients. The disease has a sudden onset and rapid progression marked by fever, pallor, anorexia, fatigue, anemia, hemorrhage, bone pain, splenomegaly, and recurrent infection. Blood and bone marrow studies are used for diagnosis and for determination of the type of proliferating lymphocyte, which may be B cells, T cells (which usually respond poorly to therapy), or null cells that lack T or B cell characteristics. Treatment includes intensive combination chemotherapy, therapy for secondary infections and hyperuricemia, and intrathecal methotrexate. Also called acute lymphoblastic leukemia. See also chronic lymphocytic leukemia. A variety of the hematologic disorder characterized by an uncontrolled proliferation and conspicuous enlargement of lymphoid tissue in various sites (e.g., lymph nodes, spleen, bone marrow, lungs) and the occurrence of increased numbers of cells of the lymphocytic series in the blood. Devise corrective measures for pipeline projects by understanding Acute Lymphocytic Leukemia (ALL, Acute Lymphoblastic Leukemia) pipeline depth and focus of Acute Lymphocytic Leukemia (ALL, Acute Lymphoblastic Leukemia) therapeutics. All but one with lymphoid blast crisis or acute lymphocytic leukemia have relapsed, but doctors are encouraged by the temporary responses. Currently, there are about two major drugs in pipeline for acute lymphocytic leukemia expecting a market launch by 2012. The encouraging news is that the cure rate for children with acute lymphocytic leukemia is 79 percent, up from the 1960 survival rate of 4 percent. 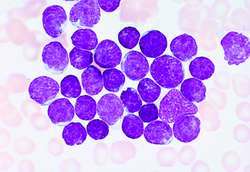 GlobalData, the industry analysis specialist, has released its new report, Acute Lymphocytic Leukemia (ALL) Therapeutics - Pipeline Assessment and Market Forecasts to 2017. The boy is suffering from acute lymphocytic leukemia and needs to undergo 10 cycles of treatment at Philippine Children's Hospital at P62,000 each. Amador is one of 1,600 children diagnosed each year in the United States with acute lymphocytic leukemia, the most common form of the blood cancer to strike youngsters. Acute Lymphocytic Leukemia (ALL) Global Clinical Trials Review, Q4, 2010 provides data on the Acute Lymphocytic Leukemia (ALL) clinical trial scenario. David's diagnosis of acute lymphocytic leukemia accounts for one of roughly 1,600 cases of leukemia expected among children nationwide this year, officials said. The heterogeneity of acute lymphocytic leukemia (ALL) makes a universal treatment for the disease extremely difficult to discover and develop: because pediatric and adult ALL are biologically and clinically distinct, treatments that work for one group of patients will not necessarily work for others. But in children like David with acute lymphocytic leukemia, the five-year survival rate has increased from 53 percent to 78 percent, officials said. Callisto's second drug in the clinic, L-Annamycin, is currently in a Phase I/II clinical trial in adult relapsed or refractory acute lymphocytic leukemia, and in a Phase I clinical trial in children and young adults with refractory or relapsed acute lymphocytic leukemia or acute myelogenous leukemia.